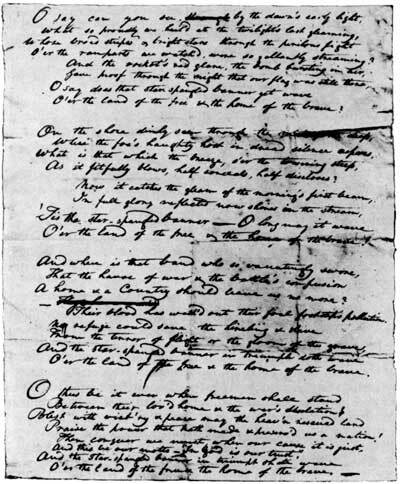 In mid September, 1814; lawyer and sometimes poet Francis Scott Key watched the battle of Fort McHenry while on the deck of a boat moored in Baltimore Harbor. 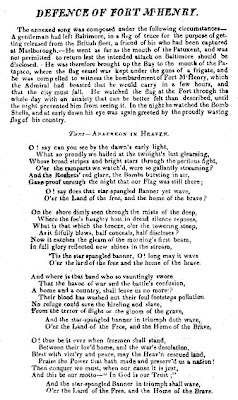 In the days following the battle, he composed a poem he called Defence of Fort McHenry. Key gave his poem to his brother-in-law who noticed that the words fit the melody of To Anacreon in Heaven, a popular pub song at the time. Keys' brother-in-law was a judge named Joseph Nickelson. 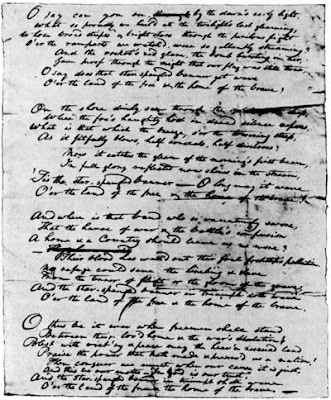 Nickelson took the poem to a printer and printed up broadsheets of the lyrics and music. 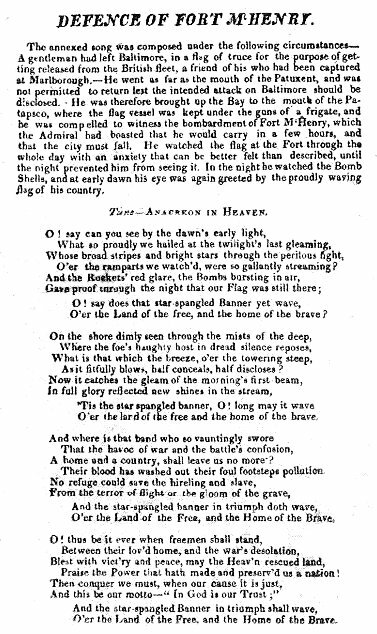 On its second printing, the name changed from Defence of Fort McHenry to The Star-Spangled Banner. This is a copy of the original broadsheet. The song grew in popularity and quickly became one of a number of patriotic songs that were used officially and unofficially by the United States. Different functions called for different patriotic songs but there was no national anthem. In the years after the First World War a movement arose to name a single, official song. Out of a number of popular anthem-like songs, The Star-Spangled Banner won and it was named the official anthem of the United States in a law signed by President Woodrow Wilson in 1931. It's a stirring song and here's one of the best renditions of it I've ever heard. Disclosure time. Francis Scott Key was one of my ancestors, something I learned when I was in college. Every time I hear our national anthem I'm reminded that I am glad to be a citizen of this great country and I'm also reminded of the sacrifices made by my immediate ancestors. I'm proud of that song and it's pretty cool to be a descendant of the man who wrote it. Lovely though it is, there's another song I think sums up the promise and potential of the United States better than The Star-Spangled Banner does. That song of course is America The Beautiful. America The Beautiful was written by Katherine Lee Bates in 1895 as a poem called Pike's Peak. It was set to music by Samuel A. Ward in 1910. Here's as stirring a version of it as I could find. Regardless of the songs you sing today, happy Fourth of July and remember the people whose shoulders you stand on. How cool that you're a descendant of such a notable American! I have always loved the National Anthem. I remember going to AAA Iowa Oaks (they became the Iowa Cubs) baseball games with my dad. I learned the words at a young age, because it was important! You couldn't start a baseball game without singing the National Anthem. It seems like more people sung along back them, or maybe it was just my perspective, but I still take my hat in hand and do my best. I am related to Annie Oakley...but I don't know if she could sing. Annie Oakley! Now there's an ancestor to be proud of! You're a true patriot! Thanks. I enjoyed this post immensely. Bits of personal and national history weaved together so eloquently. This rendition of "The Star Spangled Banner" was inspiring, performed by a group who patriotically held firm for their beliefs, endured crushing duress and prevailed. "Don't tread on me!" can be interpreted many ways but, in my opinion, distinguishes the spirit of our country. Very fitting on its birthday! Susan & Peter Bellamy's ancestor wrote the Pledge of Allegience. Great grandfather or some such. Love the story, and especially love the Dixie Chicks' rendition of the National Anthem. It is understated and simple and beautiful and I am tired of all the vocal gymnastics inspired by shows like American Idol. I ate off Francis Scott Key's family china once. Had I known you were related, I've have stolen a bread plate for you. I thought I told you that Tom. Hmm. I did not know about your having dined on Key family china. As nice a bead plate would be, I'd rather a royalty for every time The Star Spangled Banner gets performed.